When asked where America is headed in Q4 as a topic of discussion for a rapidly upcoming interview, I wrote back that I am less sure where America is headed in Q4 than “down the road” in general. The whole thing (political, financial, economic) could fall apart at any time. On Monday, August 27th, 2018. In a week. In a month. In a year. In a year and a half. I just don’t know, for “markets can stay irrational longer than investors can remain solvent” (Keynes said some smart stuff like that, and even he didn’t subscribe to governments’ forever rising tides of red ink, but rather applauded generating deficits only during recessions that would then turn into surpluses during recoveries, but I digress). That said, and as per my latest post on QT, I believe the Fed’s monetary tightening will greatly hasten the “reset day.” The Fed’s sustained tightening is already causing numerous EM currencies, stocks, and bonds — trillions of which (out of $58.5trn in aggregate) are denominated in dollars, with $500bn coming due in 2019 alone — to implode. Meanwhile and concomitantly, the Fed is increasingly choking off growth in a debt-addicted US and global economy while raising EM’s financing costs in currency and interest expense terms. This is especially true as we haven’t addressed what I call a toxic public policy stew. Translation: as unelected bureaucrats, statist politicians, judicial despots, and crony capitalists remain busy killing the free market patient (esp. in the west and in India), private sector wealth creation, productivity, and good jobs, everything runs on access to (yet more) credit. Take that away or make it more expensive without removing free market capital’s growing “global corset,” and that overdue recession won’t be overdue much longer (and neither will a stock market drubbing reaching US shores). A “run-of-the-mill” recession would be a celebratory benign outcome on the heels of decades of political, financial, and economic malfeasance by an ever more entrenched global “ruling class.” Call them oligarchs, plutocrats, fascists, lawless tyrants, or even central bankers. In any event, serfdom suits them all just fine, and they are well on the road to ruin (for the “99%”). Now, of course such “deplorable” topics weren’t discussed at the annual Jackson Hole central bank love-fest a few days back, nor will they be discussed in the Alps of Switzerland in the coming winter (otherwise known as Davos). Carping aside, back to getting a bead on what’s going on/going down. We all know how intertwined today’s global capital and currency markets are — more than ever before thanks to globally coordinated and orchestrated “financialization.” For flavor and for a preview of coming attractions (“Deutsche Bank” and bankrupt governments), you may recall how in 2008 UBS, the “unassailable” Swiss financial titan, was nearly brought to its knees due to huge exposure to imploding US mortgage asset valuations, including $26.6bn in investment-grade “junk.” If it hadn’t been for a swift taxpayer bailout, massive fund withdrawals by UBS’s creditors and depositors would have rendered the bank both illiquid and insolvent. My point: how does one spell CONTAGION, revisited? And let us not even get bogged down in the quadrillions of dollars in derivative exposure risks by leading financial institutions, the largest chunk of which are bets that global money center banks made on interest rates staying abnormally low, despite unprecedented monetary inflation risks and/or insolvency risks (Venezuelan-style monetary debasement is just another form of insolvency or complete loss of creditors’ purchasing power). As such, if interest rates “rise from the dead,” many banks will be dead, and those parties that would have enjoyed huge profits from rising interest rates, won’t. A global financial meltdown, perhaps triggered by banks’ material exposure to rising interest rates or to escalating non-performing EM loans, wouldn’t be out of the question. A metastasizing contagion suggests a fairly quick and record reversion to QE by the “terrifically exposed” Fed and a return to fed funds rate cuts is just out of sight (when push comes to shove, the Fed will protect its owners’ balance sheets; those balance sheets belong to the big money center banks). When this manifests, I believe it will be the wake up call that finally makes investors smell the “traditional asset and RE bubble valuation coffee.” And once the algos go in reverse — feed on themselves in a falling market by triggering yet more sell orders — we will finally have that big, fat, overdue, and ugly reset: every asset gets repriced down relative to gold (and, by extension, silver). Recall that markets are “reversion beyond the mean machines.” In this case, from boom valuations to bust valuations. Upshot: we should once again see single-digit P/Es and double-digit bond yields — and nasty inflation/stagflation, as a crack-up boom finally ensues on the back of some $16trn in global central balance sheet expansion over the past decade that starts to find its way into the “real economy” with a vengeance (recall that central bankers have been desperately trying to stoke more inflation, and that once inflation starts, it typically gets out of control). Arguably, we’ve never had so far to fall, globally speaking, because we’ve never had each major currency utterly divorced from any kind of defensible precious metals backing and discipline (although this could be on the verge of changing in both Russia and China with precarious implications for the greenback, especially if Germany wants a viable global reserve currency alternative to the buck), which has gotten us into all sorts of political, financial (debt), and economic trouble. Not a good time to have asset valuation acrophobia. We are so close to numerous remaining bubble asset valuation implosions, and President Trump’s trade antics and/or heightened political instability in the US and in EM, from South Africa to Turkey to Iran to Venezuela, threaten to make the global reset “closer still.” Why? Because increasing political uncertainty and tariff wars will “kill” already globally weak economies facing the headwind of rising debt-induced interest expense growth prior to any interest rate normalization, much less “overshoot.” After a 37-year bond bull market, one can almost hear the rumbling, even at the dollar-based center of global finance. In the interim, the rule of law is virtually dead in the US and the West, and the un-elected, statist bureaucratic chieftains, with their powerful, protected jobs and their well-paid, ever-growing staffs (over 2m civilian bureaucrats in the US alone), have successfully usurped legislative prerogatives from elected officials — specifically, from the Congress in the US and from parliaments in Europe. This, coupled with legislating from the bench, has not only effectively ended representative government in many OECD nations, but it has eviscerated working citizens’ property right protections, free market capitalism, productivity, and numerous nations’ balance sheets: at nearly $250trn in operations-based debt, the globe’s $81trn economy is too encumbered for anything but a destructive debt-based deflation. That deflation will be fought tooth and nail with the printing press for political reasons until fiat money and its purchasing power are totally destroyed, as has always happened. Simultaneously and sadly, unless reversed in time, many western nations’ sovereignty, cultures, codified individual freedoms, and tolerance will also be balkanized away. Needless to say, budding resistance to this destructive status quo is resulting in growing political divides, which in turn is fueling rising tensions and potentially destabilizing political situations from Italy to the UK to the United States. If this continues to ratchet up, as “populists”/workers increasingly clash with leftists/globalists, this could yield political paralyses, constitutional crises, and/or, in a worst case scenario, anarchy or war. Needless to say, all of them would pressure stock, bond, and real estate valuations, including in “safe haven” America. Speaking of America, the buck and the US stock market, which have been rallying as many ROW currencies and equity markets come under substantial pressure, are arguably the biggest, most unsustainable, and most foreign capital and import dependent bubbles of all (and of all time). Ultimately, the US, the world’s largest net debtor nation ever (nearly $8trn) — a nation long lacking robust domestic savings that may well be looking for between $2trn – $3trn in new net financing p.a. given its current trajectory, which a stouter recession would widen substantially — cannot possibly have a sustainably strong currency. Said is all the more true if that nation’s central bank appears bent on driving an economy still caught in a Fed-enabled bureaucratic and litigation (red tape) straight jacket, and way overdue to enter an “official recession,” right off the cliff. They say that all politics is local. And that everything is political. Well, when the Keynesian-overkill dolts or the central planners/monetary despots (pick your poison) running the Fed figure out that their owners are not going to be happy nor as rich on the heels of America’s stock bubble getting pricked (been there, done that in ’08, and this time around taxpayer-funded, TARP-style bankster bailouts are allegedly off the table), they will quickly resort to the only tools in their fiat currency toolkit: revisiting QE and a rapid trip back to ZIRP from a still pathetically low fed funds rate. And, by the way, that 1.9% effective rate amounts to a negative real rate. This is true either using fake government inflation stats pointing to 2.9% inflation currently, or if looking at a more credible estimate of inflation running between 6% – 8%. The Fed’s (and other leading central banks’) doubling down on financial repression anew will prove what a big, fat, and ugly failure their policy of financial cocaine has been. Economic (productivity) devastation. A dwindling middle class. Ever greater, increasingly unheard of, and (often) cronyism-induced wealth concentration. 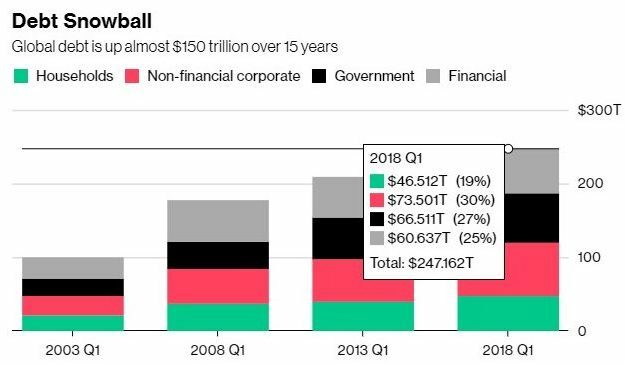 Yet, most ironically, even more QE will be required given that the economy is drowning in the very debt that the central bankers have enabled. Plus, politicians can’t go cold turkey without getting fired at the ballot box (let’s not forget increasingly imperiled pension plans) and central banks will protect, well, banks. And that last man standing, the USD? It will be naked. Not such a pleasant sight, especially when considering dollar-based assets. At such a juncture, which we view as imminent, even the most clueless deniers will have to realize that we are now irreversibly and increasingly quickly on the path to complete global fiat currency destruction — and that all assets deriving their value from being tethered to unbacked currencies will be “collateral damage.” Most stocks, but especially bonds given “repayment impossibilities,” are going to get killed. Global printing press-led currency devaluation contests will sprout once the 800-lb Fed re-enters official currency debasement. A budding trade war would only add fuel to the fire. Silver and gold (real money for thousands of years), and other vital real assets, starting with the dense energy and ag complexes, will be good places to seek huge purchasing power gains as well as purchasing power protection. Reasons: precious metals are money and dense energy and ag assets are increasingly scarce/can’t be printed, and they remain vital both to leveraged output and sustaining 7.2bn people’s lives. Meanwhile, select short-term government bonds, such as US T-Bills, will be good places to hide pending emergence of true bond, stock, and real estate bargains. The reason: governments can print the money to repay these bonds. Plus, short-term government bonds avoid both interest rate risks and bank bail-in risks. There is bail-in legislation in place throughout the OECD world that will have your bank deposits converted into bank equity of very questionable value if necessity dictates, which could happen as taxpayer bailouts are, well, out. You didn’t intend to buy bank shares with option-like valuations with your money, did you? Speaking of which, avoid bank illiquidity risks. And remember something about that bank account of yours: your deposited funds represent unsecured (junior) creditor claims! With banks typically investing over 95% of depositor funds and depositors typically representing well over 50% of bank financing, you want to limit your exposure here, FDIC insurance protection notwithstanding. Reason: the FDIC’s funds would cover only 2% of insured deposits. Moreover, deposits at risk can’t be money, right, because money is supposed to be both without risk and without yield?! While your bank accounts or money market accounts are virtually without yield (and devoid of a real yield), they certainly aren’t without risk, so why not shift excess (beyond working capital needs) funds into short-term (two or three month) government bonds? In closing, let me now revert to the opening question, namely where is America heading in Q4? Once again, I don’t know where America will be in Q4. As regards a reset (in dollar and all fiat currency terms, massively lower bond, stock, and real estate values juxtaposed against substantially higher precious metals prices and, over time, materially higher scarce vital asset prices), it could be earlier or later. That said, I would state that America’s currency and America’s bond and stock markets will be heading where much of the world has been heading, especially the EM, because the whole world is basically in the same leaky political, financial, and economic boat. It would not surprise me if a US-based reset started to develop prior to year’s (2018’s) end. Once it starts, a rout will be difficult to stem. By contrast, it would surprise me greatly in today’s globally intertwined financial and economic world if the wheels didn’t come off the current American valuation bus by next year, especially given mounting confidence (political) and economic challenges, very much including an overdue recession. We live in “exciting times” full of risks and opportunities of a possibly once-in-a-lifetime nature. That quiet before the storm, that “big fat eye of the hurricane” that I mentioned in March numerous times via various publications, could be departing. Consider reallocating. Afterwards, brace for up to 156 mph/251 km/h wind speed, or a category 5 financial storm. And then back up the truck. But don’t rush. Ultimately, unbelievable bargains will be available that most won’t consider in bonds, in stocks (and entire businesses), and in real estate. Reminds me of precious metals today. This commentary is not intended as investment advice or as an investment recommendation. Past performance is not a guarantee of future results. Price and yield are subject to daily change and as of the specified date. Information provided is solely the opinion of the author at the time of writing. Nothing in the commentary should be construed as a solicitation to buy or sell securities. Information provided has been prepared from sources deemed to be reliable but is not a complete summary or statement of all available data necessary for making an investment decision. Liquid securities can fall in value.